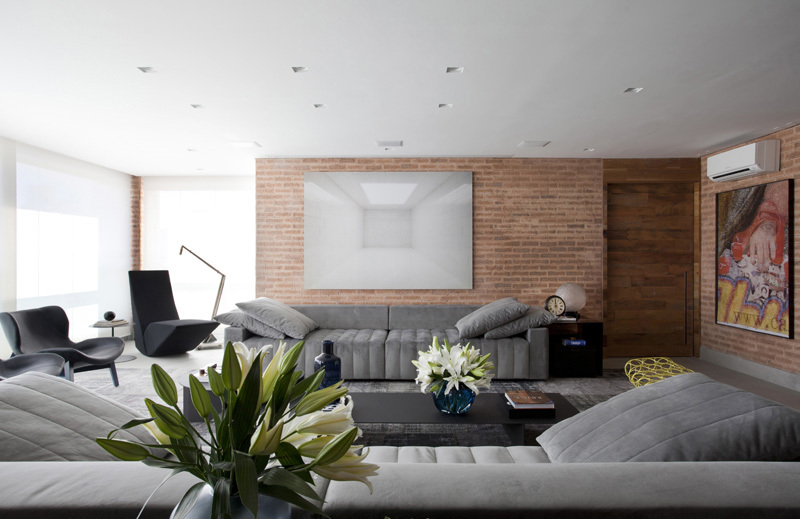 An apartment with brick walls around in the interior and dark furniture. An entire family including those with kids can actually occupy a home no matter how small it is as long as it is well-planned. 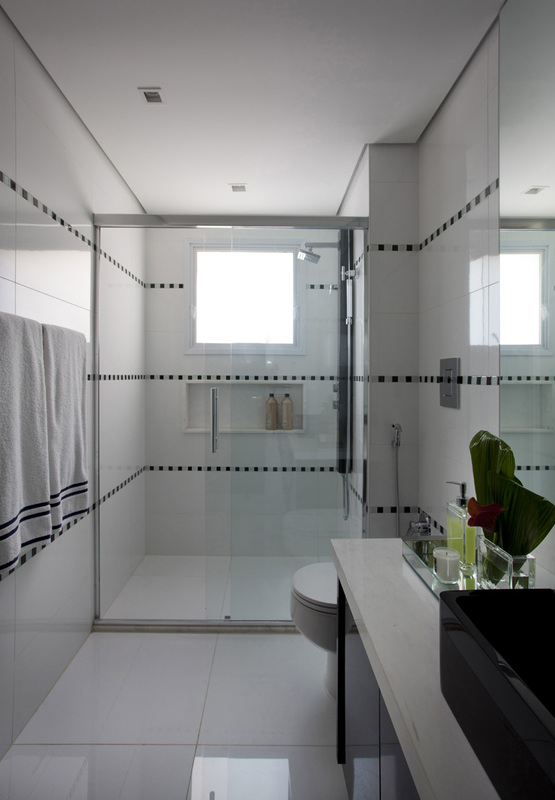 We have seen many family homes or even apartments that aren’t very spacious but were able to accommodate all the needs of the family because it is designed well. But there are also apartments which are spacious and obviously, the owners are blessed to have a large space where everything they need can be integrated. 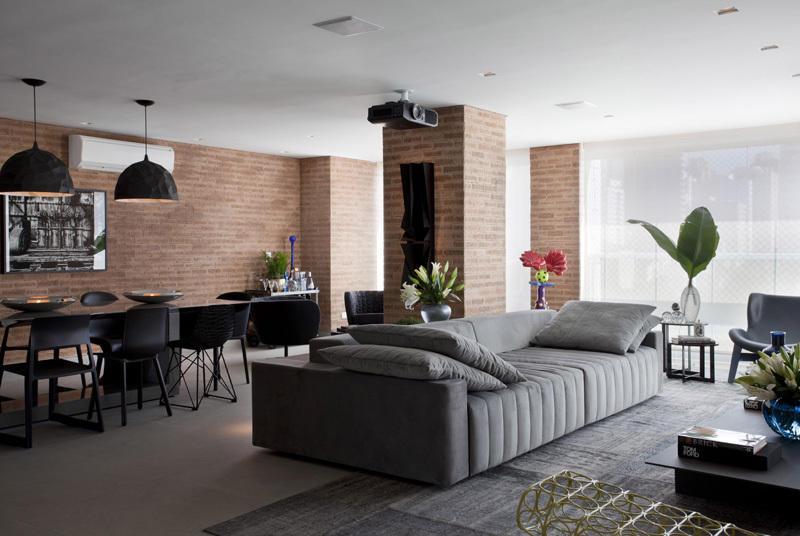 An apartment in Sao Paulo, Brazil that is intended for a family of 4, with two young children is designed by Marcelo Rosset Arquitetura. 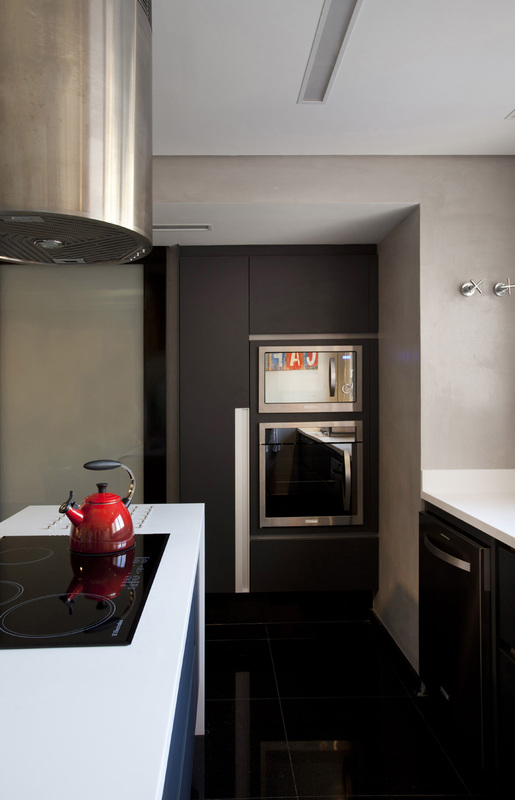 The home has many interesting features and has a modern design with subtle touches of industrial and contemporary look. What made me think that it has an industrial feel is because of the bricks on the wall and gray flooring. Most of its furniture is either black or gray and some contrasting white colors. Let us take a look at the interior of the home below. 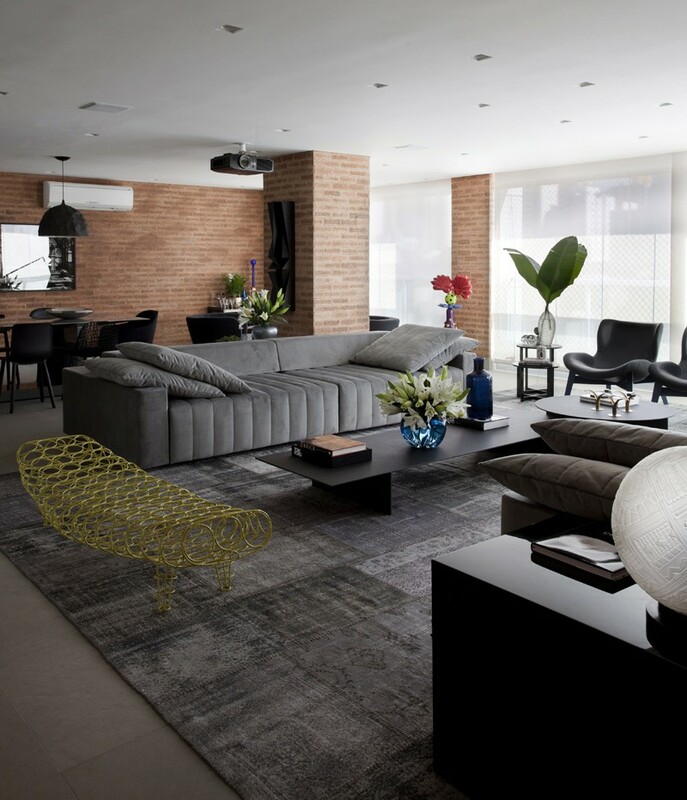 Unique feature: The interior features a brick wall all around it with gray flooring and beautiful furniture in black, gray and white colors. The interior of the apartment looks really nice and warm because of its colors and materials. It has gray furniture that sits against the brick walls and white walls. You can see that different furniture are used in here and were put together. From the living room, one can easily access the dining area just beside it. The apartment has an open layout design. There are many unique features in the apartment but even if each one is different, they all made an impressive impact together. Notice that bench that is seemingly made from wire. The dining area has different kinds of chairs around a glass dining table. Even though they have varying designs, they are all black in color. On the wall, you can see beautiful black and white artworks. 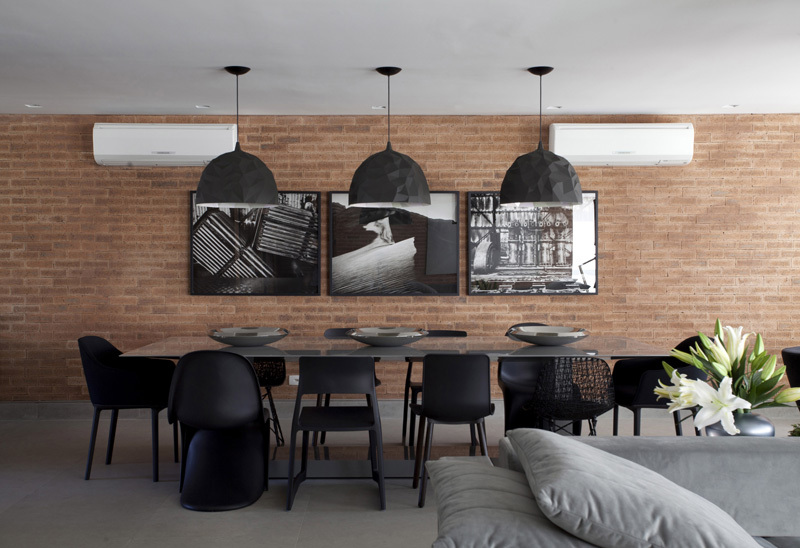 Black pendant lights are also used for the area which compliments with the chairs, the brick walls and a wooden accent wall. 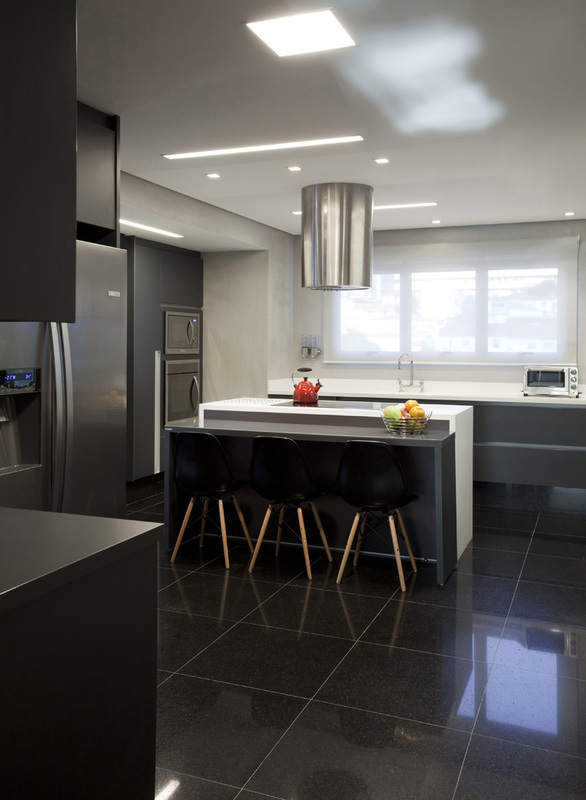 The kitchen is just located near the dining area and has black stools on the white and gray kitchen island. The kitchen has the same color scheme as the rest of the house. 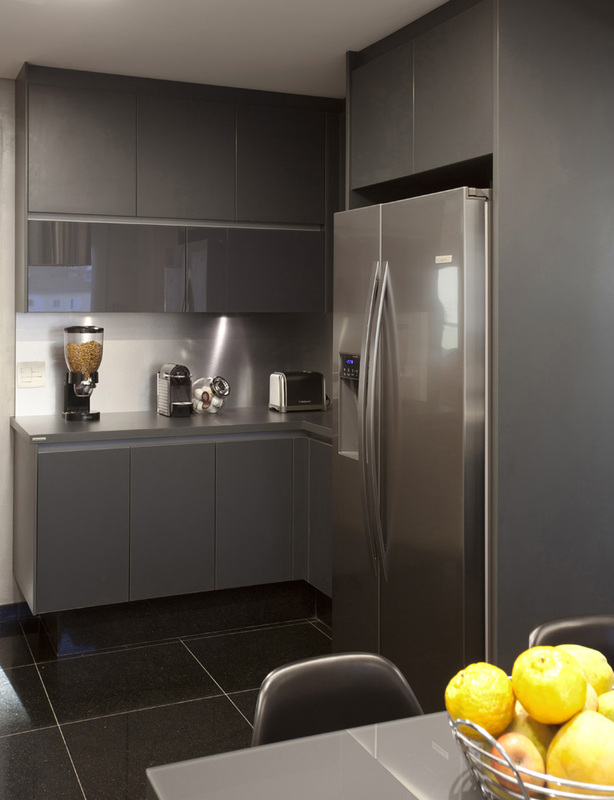 Its use of stainless appliances bring some sheen to the area. Cabinets in the kitchen are grey in finish. It is a good idea to elevate if from the floor to avoid a boxy look because the flooring is already dark. 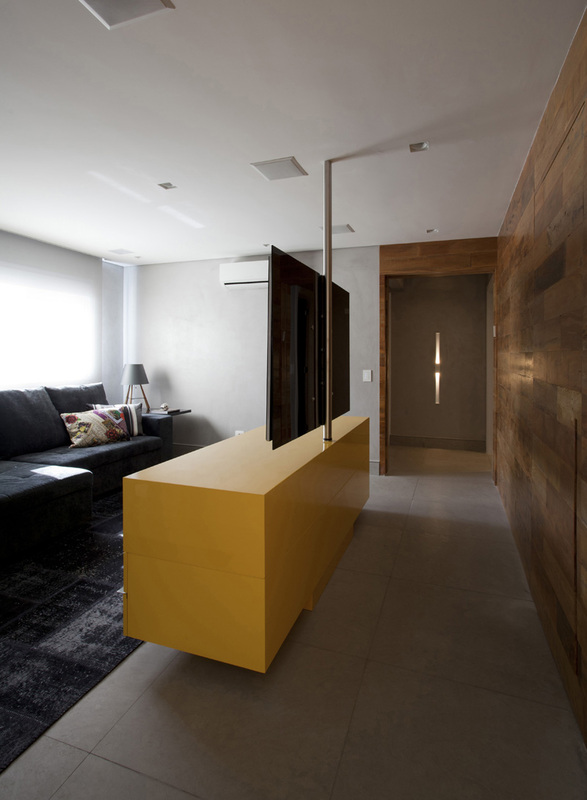 While most of the furniture is gray, this one has a light yellow entertainment system that holds the television and other appliances needed for entertainment. The entertainment area isn’t that spacious and it has a small hallway at the back of the television. This is the master bedroom with dark colors in the low dresser, bed and even the curtains. This bed looks nice right? It seems to float but it doesn’t. 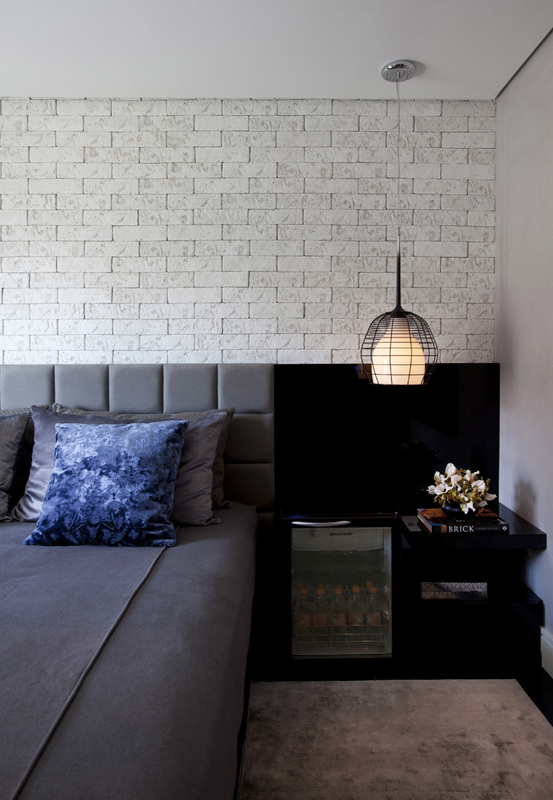 The wall in the bedroom also has bricks but this one has white colors. At the side of the bed is a table and a cooler for drinks. 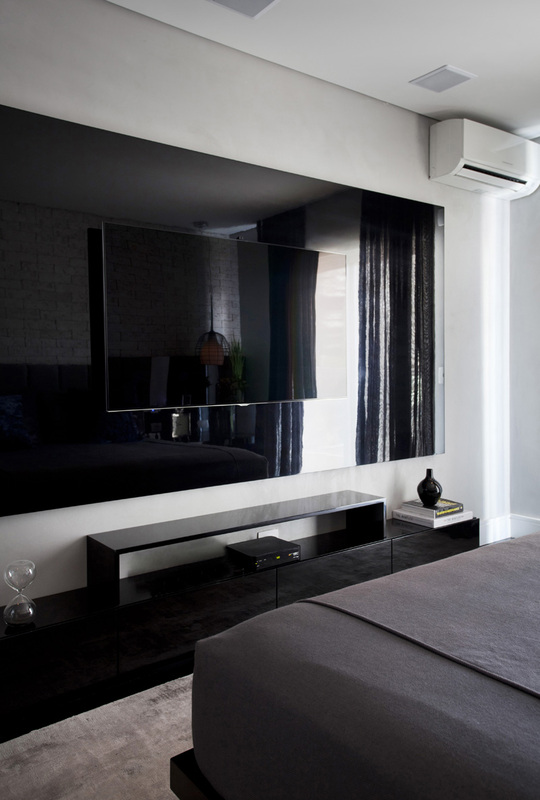 The area where the television is installed has a dark glass that gives it a hotel feel. The kid’s also have their own space where they can study, rest and have fun. There is a soft couch placed in front of the television and on top of a grayish area rug. There are fun elements in this space because it is intended for the kids. And when it is time to take a little break from watching movies and playing, they can always go to the bathroom which is seen in this image. This is the bathroom in the children’s area. 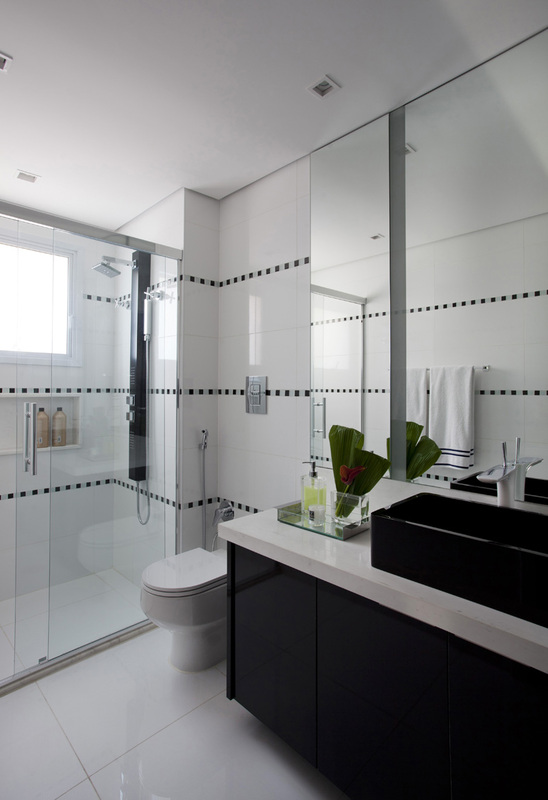 It has a glass enclosure for the shower and a black and white accent on the wall. 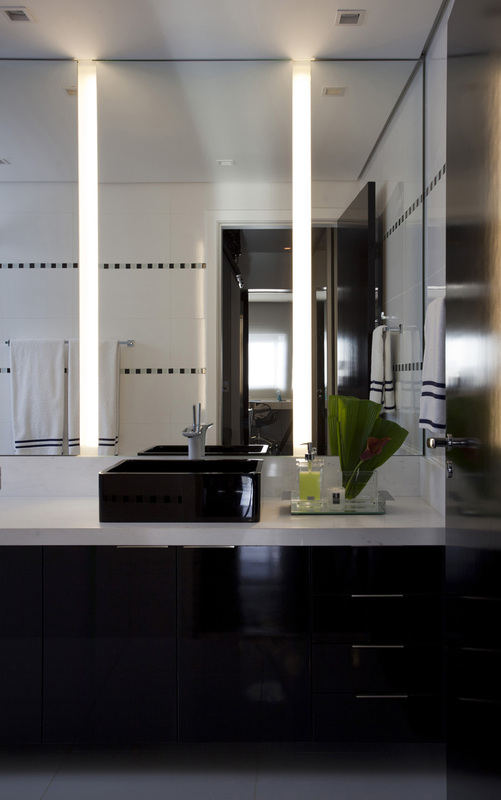 A black vanity with many drawers are seen in the bathroom. Aside from the vanity, the sink is also black. What add brightness to the area are the mirrors and the light at the back of it. Beautiful, right? I am sure you love the look of this apartment. It looks masculine because of the colors in it as well as the decors. I can say that the space is well-planned and the layout is well done especially that it has an open plan layout. 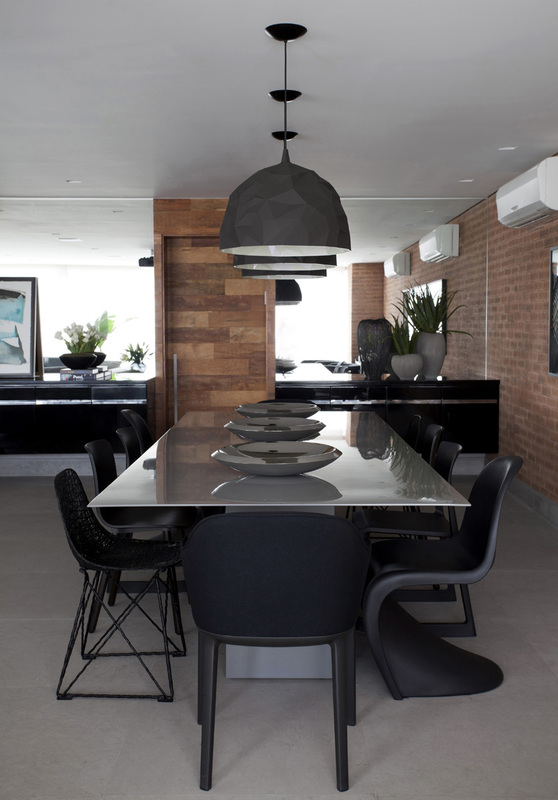 The apartment is designed by Marcelo Rosset Arquitetura. You can see that there are many interesting and creative elements in the interior from the decorations to the furniture just like the bench in the living room that is seemingly made from wire. Can you tell me which items you find interesting?